Brakes, diesel particulate filters, electronics and wheel-ends are some of the key components that fleets should inspect on their vehicles as they recover from flooding brought on by hurricanes Harvey and Irma, experts said, adding that without remediation safety component failures are likely to surface in a matter of months. All components submerged in salt water should be replaced, they said. When submerged in fresh water, strip down everything and put back together. “It all depends on the waterline,” said Darry Stuart, principal of DWS Fleet Management of Wrentham, Mass., by which he meant that parts that were underwater may be damaged, while parts that were not submerged likely are fine. Stuart, who was also the 2007-2008 chairman of the Technology & Maintenance Council, a division of American Trucking Associations, cautioned against jumping the gun with replacing parts affected by fresh water. “I’ve seen cases when somebody thinks insurance is paying and they go nuts, file a claim and then all of a sudden they realize insurance only paid for the practical side,” he said. We developed a very comprehensive inspection process around the level of water, whether it be hub level and below, top of frame and below and over frame. Bendix Commercial Vehicle Systems has posted on its website a podcast on how to inspect and help return power vehicles and trailers to service following exposure to floodwater, according to the company. Not every fleet will do what’s necessary, right away, said Kevin Pfost, product specialist at Bendix Spicer Foundation Brake — Bendix Commercial Vehicle Systems and Dana Commercial Vehicle Products. Heavy-duty component manufacturer Stemco noted technicians and the environment should be protected from possible contamination from units that have been submerged in water. Stemco also has tips on how to identify damage to wheel-ends, lubricants and hub caps at its website. Penske Truck Leasing had completed 75% of the inspections on every piece of its equipment in the Houston market by Sept. 19, including rental straight trucks, tractors, trailers and its one-way fleet, said Jeff Hunt, Penske’s vice president for field maintenance in the South Central region, based in Fort Worth, Texas. “We developed a very comprehensive inspection process around the level of water, whether it be hub level and below, top of frame and below and over frame,” Hunt said. Extra technicians were brought in from across the region to expedite the process, according to the company, which operates an overall fleet of 260,000 trucks. Penske declined to say how many pieces of equipment were worked on in the Houston market. 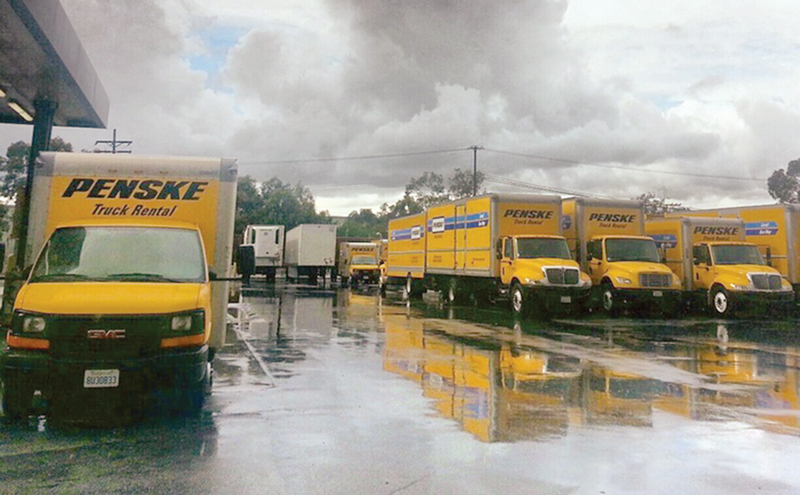 Penske Logistics ranks No. 21 on the Transport Topics Top 100 list of the largest for-hire carriers in North America. “The diesel particulate filters, the one-box systems as well, were the primary items affected, and we were able to clean them out and run through a regeneration process as recommended by the OEMs, depending on the vehicle, make and model,” Hunt said. Contamination of stored fuels is a very common aftermath of hurricanes, said Jeremy Whiddon, vice president of business development with fuel distributor Atlas Oil Co.
Remediation of fuel contamination requires inspecting the fuel tanks, removing any water and cleaning — or “polishing” — the fuel. “It is a very important part to getting the infrastructure back up and running again,” he said.